If you are an antique doll collector or simply want to dress a special doll in a complete, historically-accurate outfit, it helps to know a bit about antique doll accessories. While a beautiful dress is an important part of outfitting an antique doll, it's the accessories that take the doll's appearance and value to the next level. From beautiful bonnets to delicate slippers, craftsmen have likely been making miniature accessories almost as long as they've been making dolls. Today, it's not hard to find miniature hats, shoes, and other items from the 19th century. Sometimes you can find doll accessories dating from earlier times, but they can be a rare find. If you're outfitting an antique doll, you'll have lots of choices. Hats have long been an important part of men's and women's clothing, and this significance was reflected in hats for dolls. Many antique doll hats are miniature works of art, featuring fine silk fabrics and ribbons, elaborate millinery flowers, and delicate handmade lace. Some are made of straw. There are also male dolls' top hats made of papier mache or real felt. Ranging in price from about $100 to well over $500, antique doll hats are popular with collectors. Various styles of doll hats have wires around the outer edge to hold the hat's shape and to allow the hat to be posed in the best position. When buying an antique hat for your doll, it's important to know the doll's head circumference. Measure the head at the widest place, and compare this measurement to those given in the description of the hat. If you're shopping in person, bring a tape measure to check sizes. Doll shoes are not as delicate as hats, but they were also easier to lose. If your doll is missing her shoes or simply needs a new pair, you can find beautiful antique shoes on the Internet and in some antique stores. As you shop, you'll see doll shoes crafted from soft leather, oilcloth, and silk. Many feature decorations like silk flowers, tiny buckles, and little laces or ribbon ties. Prices for antique doll shoes range from about $100 to about $400, depending on the type of shoes and their condition. Buying shoes for an antique doll is a little trickier than buying a hat. If you know your doll's model or name, you may be able to find shoes made especially for that doll. Otherwise, you can measure the length and width of the dolls foot as accurately as possible. Since foot shape may vary, it's also a good idea to examine a photograph of the antique shoes to see if you think they will fit. 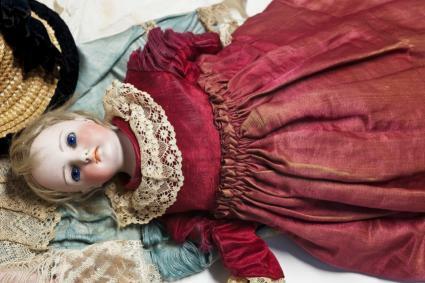 Fully outfitting an antique doll may also involve buying period stockings and other items. Antique doll socks or longer doll stockings come in delicate hand-knit lace, solid colors, and sensible black or white. They typically range in price from about $20 to around $100. Look for stockings that match the foot and leg measurements of your doll and have no condition issues like holes of botched repairs. If you already have shoes for your antique doll but want to give them a little more style, consider antique shoe buckles. These tiny shoe decorations are also a great way to add authenticity to reproduction doll shoes. Antique shoe buckles usually cost under $50. Tiny fans were popular for Victorian-era lady dolls, and these little fans can seem like extraordinary works of art. Many are fully functional, and they are often crafted from silk, feather, lace, ivory, or wood. Expect to pay between $200 and $300 for a beautiful antique doll fan. You can also find antique purses in doll sizes. These tiny purses are crafted from leather, metal mesh, beads, and fabric. Many feature elaborate decorations, and you'll also find some that are fully functional. Prices range from around $20 to over $100, depending the age, condition, and materials used. Some antique dolls originally featured necklaces, bracelets, and other jewelry items. Even if your doll didn't originally come with these pieces, they can be a great way to add period style and value. Doll jewelry is difficult to find, and it is usually made of tiny glass beads, metal pieces, or even gemstones. Prices vary widely depending on the condition and the materials used. Since antique accessories can represent a significant investment, it's always a good idea to have your finds appraised by an independent dealer. If you're planning to sell and antique accessory, this is also a good way to get an idea of its value. As with many antiques purchases, doing your homework will save you money and heartache.